There is something that competes with chocolate for my favorite dessert flavor, and that is salted caramel. Salted caramel ice cream? Yes please. Salted caramel cupcake? Oh my. Chocolate covered caramel with sea salt on top? I’m giddy with excitement. 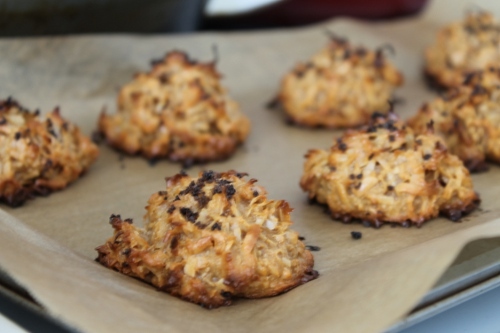 So when I decided to bake coconut macaroons for the first time, I could’ve gone the chocolate route and incorporated chocolate chips or cocoa powder, or dipped the macaroons in chocolate. But I thought, no, let me give some love to my other favorite dessert flavor. And to make it even better, instead of caramel, I’m going with dulce de leche. just look at how thick that is! Remember espresso salt sprinkled on top of Nutella fudge and dark chocolate cookies? In fact one of my friends even said that he will die a happy man because of these macaroons. You know if your friends start hypothesizing about their happy demise with your baked goods, that you’re doing something right. Mix the coconut and flour together, then add the rest of the ingredients except the espresso salt. Stir everything together until combined. Place 2-inch balls of the mixture on baking sheets lined with parchment paper. 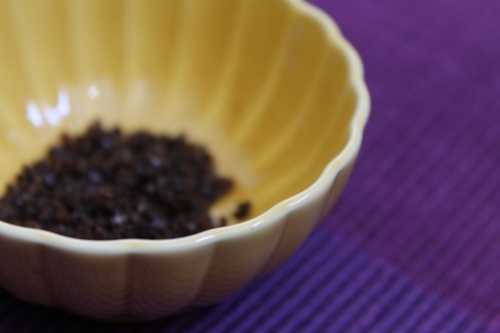 Sprinkle the macaroons with espresso salt, or any other flaky salt. Bake for 15-20 minutes or until golden brown. The bottoms got a teeny bit burned but they only tasted more caramelized and got stickier. The salt tempers the sweetness of each macaroon, so if you like salty-sweet desserts, you will like this! Do you have a favorite salted dessert? These look so incredible! 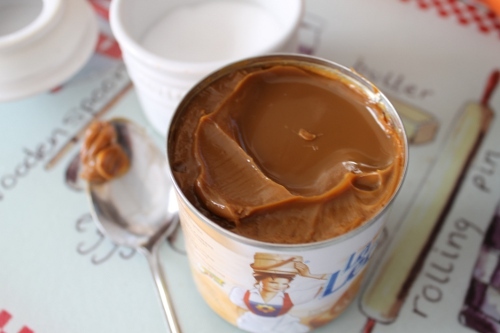 I love dulce de leche and the sweet/salty combination. Thank you for sharing! 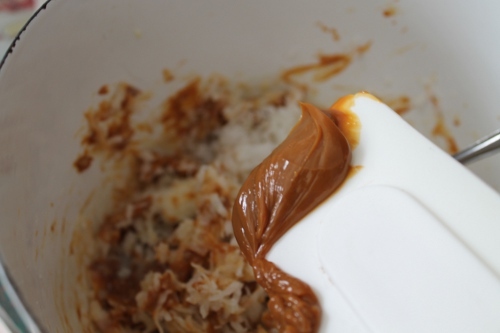 Hi Claire, there really is something about dulce de leche and sweet/salty combos that is so appealing! These look wonderful, I love macaroons! Haha Shannon you’re my kinda gal! Oh these look fabulous! 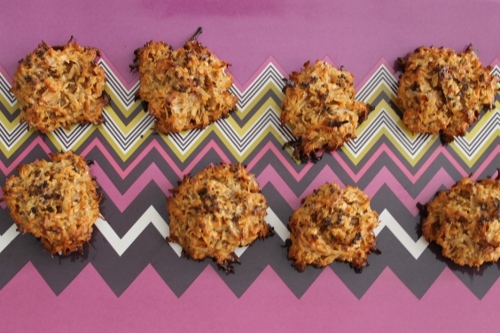 My dad loves macaroons so I will have to make these for him soon! Hi Kathryn, that’s great – I hope you and your dad likes it! These look dangerously delicious. I had the best salty dessert last weekend. Salted caramel sundae. Salted caramel ice cream. Topped with hot fudge, peanuts, and caramel corn. You probably know that I love ALL things salty and sweet. These look like the perfect balance! Wow. These look insane. 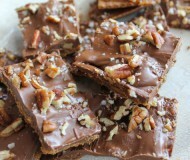 I need to make these right now. Seriously. I might have to leave work. These look delicious – love the flavor combination. I really may have trouble not licking the bowl! these look fantastic. and is that a missoni for target tray?! very cute! Daisy – yes that’s a Missoni (Target) tray! 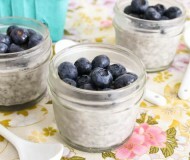 Wholly yummy these look delicious Bianca! I must try and make them this weekend. I am not much of a baker, but these look so easy that even I would enjoy making them. Plus I’m a HUGE salted caramel fan; we made salted caramel brownies for the Bloggers Bake for Hope earlier this year, and I’ve been addicted ever since! 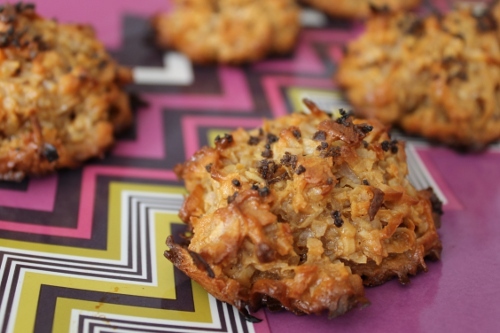 I’m not a big fan of coconut macaroons, but with dulce de leche, I might have to be! Yum! Those look great! I’ve been wanting to try the Sprinkles Salty Caramel cupcake forever now, but I always miss it (it’s a flavor they only have twice a year). It comes back November 4 though, and this time I WILL get it! You are right, it’s so hard to resist licking the batter, especially when it looks so yummy! Your macaroons look gorgeous! 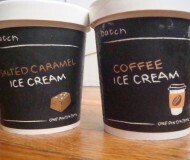 Dulce de leche ice cream used to be my absolute favorite.. these would definitely get the vote of approval in my house! Ahhhh! I was totally imagining this and wondering whether it would work just the other day! With that exact Nestle version, although it’s called “Top-n-Fill” in Australia. Hurrah for your experiments! 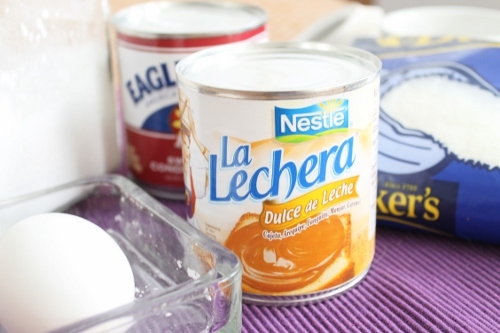 Anything with dulce de leche makes me a very happy girl! These look incredibly good – love the touch of saltiness. My fave salty/sweet treat is salted pb cups. Oooh Reeni salted PB cups sound awesome! i’m a fan of the macaroon, that’s for sure. incorporating the oh-so-magical flavor of dulce de leche is brilliant and make these what must be the best macaroons ever. well done! :D wow, I’m tired today.